Lined with charming red-roofed villages, steeply terraced vineyards, picturesque churches and the crumbling ruins of medieval castles, the Danube River has captivated writers, musicians and artists throughout the centuries. Explore such legendary capitals as Prague, Vienna and Budapest, as well as remarkably preserved towns and villages that appear untouched by the passage of time. 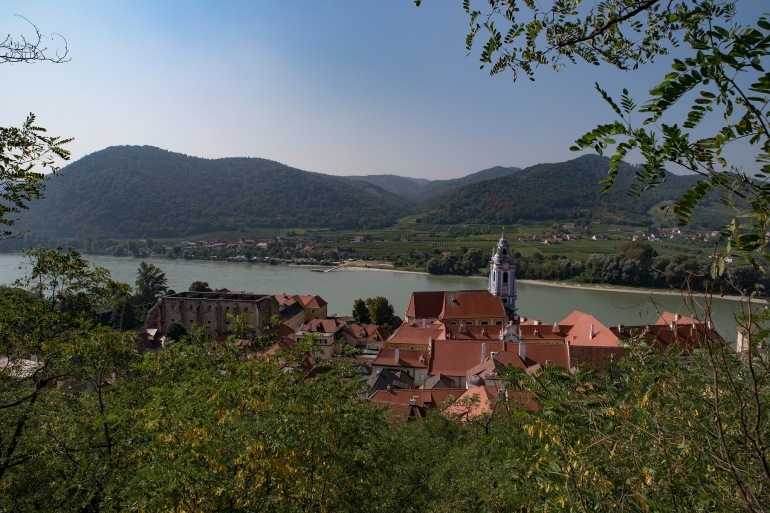 Along the way, savor the world-renowned wines of Austria’s Wachau Valley, indulge in decadent local cuisine and tour a 900-year-old Benedictine abbey in Melk. This morning, choose between a standard city tour and a hike. Both will reveal why Prague is considered one of Europe’s most attractive cities, with a historic city center that’s recognized as a UNESCO World Heritage Site. You will see Rudolfinum, the National Museum, Wenceslas Square and the Hundertwasser Dancing House. Next, visit the 1,000 year-old Prague Castle and St. Vitus before walking over the romantic Charles Bridge to the Old Market Square, where you will find the capital’s famous Astronomical Clock, Tyn Church and the statue of Jan Husek. The rest of the day is at your leisure, perhaps to enjoy yourself in one of the city’s many charming cafés. Spend a day at your leisure, perhaps to stroll through a museum or gallery, wander along the banks of the Vltava River, relax at an outdoor café, or shop for local handicrafts. Depart Prague this morning and stop in Regensburg for a guided walking tour of one of Germany’s best preserved medieval cities, a UNESCO World Heritage Site. After lunch on your own, continue on to the charming 1,200-year-old Bavarian town of Vilshofen and board your luxurious ship. Later this afternoon, join your fellow passengers at a private Oktoberfest celebration in Vilshofen, with traditional beers and Bavarian folk music and dancing. Later, enjoy a festive Welcome Dinner aboard the ship. This morning you are free to explore Vilshofen’s beautiful old town before cruising to Passau. This afternoon you will have a walking tour of this 2,000-year-old city, noted for its Gothic and Italian Baroque architecture, cobblestone streets, and St. Stephen’s Cathedral. The ship arrives this morning in Linz. Enjoy a walking tour of the second largest city in Austria or choose a guided bike tour that will show you around the Old City Center, along the Danube River, and past the ultra-modern Ars Electronica Center. Later, you will have a choice of three different excursions. The first option is an excursion to Salzburg, Mozart’s birthplace, where you will take a walking tour of the historic center made famous by "The Sound of Music.” The second option is an excursion to the Czech town of Cesky Krumlov, a wonderfully preserved medieval town nestled in the hills just over the Austrian-Czech border. The third option is a visit to the Austrian Lake District, the scenic Salzkammergut region. All three regions are UNESCO World Heritage Sites. Cruise through the narrow Strudengau this morning en route to Weissenkirchen. You have three choices of how to explore Dürnstein today. The first is a walking tour along the town’s cobblestone streets followed by a visit to the magnificent Benedictine Abbey at Melk, one of Europe’s largest and most famous monastic sites, home to religious relics and a library filled with medieval manuscripts. Alternatively, you may join a hike up to the fortress where Richard the Lionheart was once held for ransom, or enjoy an Apricots and Sweets tasting instead. Tonight, after dinner on board, enjoy a wine tasting at a local winery. Single Supplement for Cruise: 50% of twin price; A+, AA+ & Suites 100% of twin price. Please see terms below for details. Single Supplement for Land: $450 per person. Itinerary Change: Please note that due to local closures, we will not visit Bratislava during cruises departing in November or December. Guests will instead spend this time in Vienna and the Wachau Valley. All rates are per person for cruise only, based on double occupancy in an entry level category stateroom unless stated otherwise. Offer is valid on select sailings only and applicable to new bookings only. Unless explicitly stated that single supplement is waived, solo travelers in a double occupancy stateroom must pay an additional single supplement amount before receiving any discounts. Ask about Solo Traveler promotions. Offer is not combinable with any other promotions/discounts, limited to availability, capacity controlled and subject to change or termination without notice. Port charges, land programs and round-trip airfare. Other restrictions apply.